COMITÉ INTERSECRETARIAL SOBRE CAMBIO CLIMÁTICO Sustainable Energy Roundtable: Next Steps Post-Kyoto: Options for the U.S. Relationship to an International. 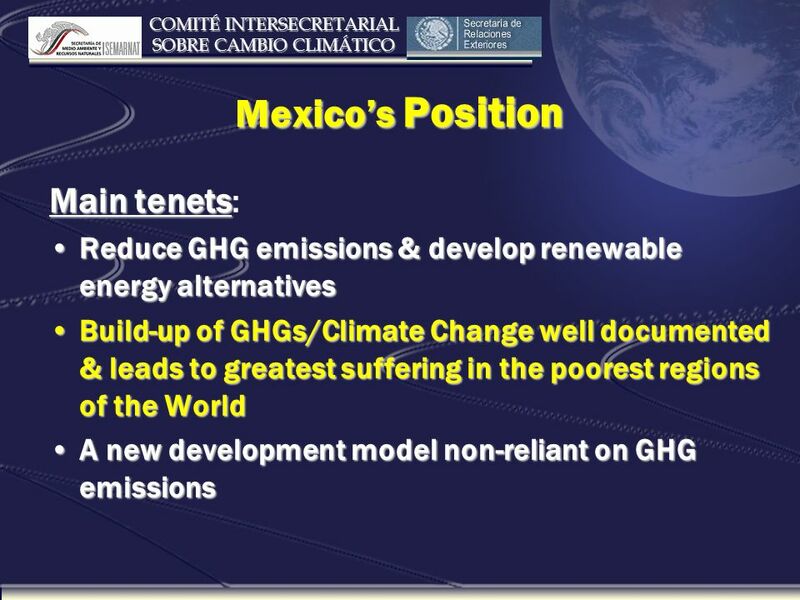 4 COMITÉ INTERSECRETARIAL SOBRE CAMBIO CLIMÁTICO Mexicos concrete Actions to Control Climate Change Intersecretarial Commission on Climate Change.Intersecretarial Commission on Climate Change. Participation in CDM (Clean Development Mechanisms): National Committee that certifies rpojectsParticipation in CDM (Clean Development Mechanisms): National Committee that certifies rpojects National Strategy on Actions to Control Climate Change National Strategy on Actions to Control Climate Change National Inventory of Emissions (GHG) & Third National Communication.National Inventory of Emissions (GHG) & Third National Communication. A voluntary monitoring and reporting program based on WRIs & WBCSDs Protocol. A voluntary monitoring and reporting program based on WRIs & WBCSDs Protocol. 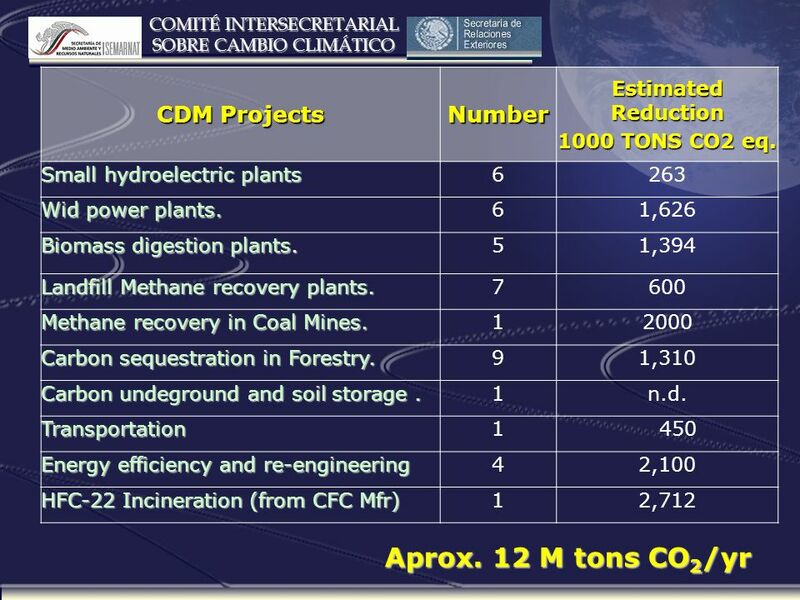 18 research projects related to climate change through the SEMARNAT-CONACyT sectorial finds. 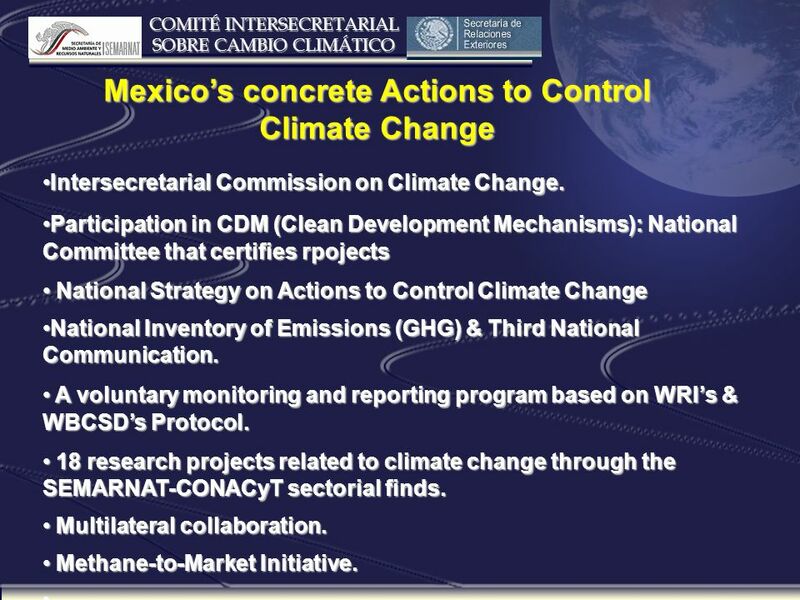 18 research projects related to climate change through the SEMARNAT-CONACyT sectorial finds. Multilateral collaboration. Multilateral collaboration. Methane-to-Market Initiative. Methane-to-Market Initiative. 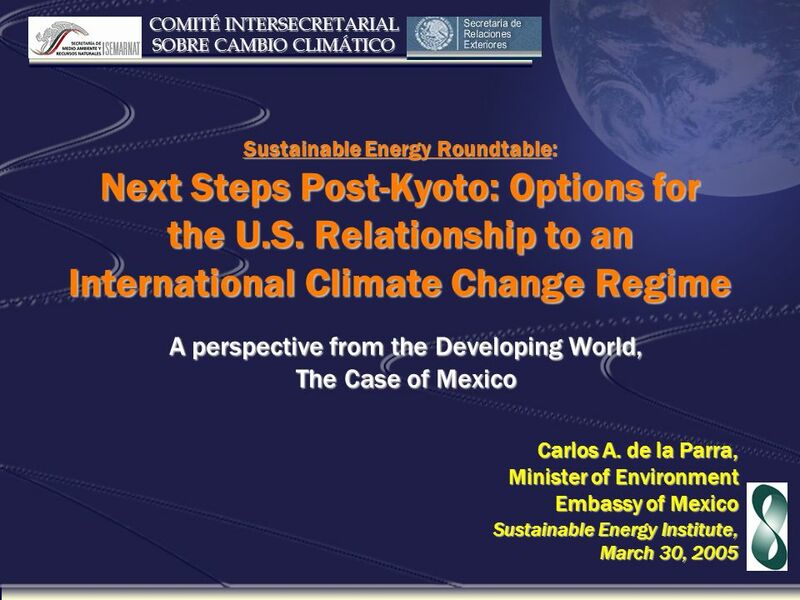 Download ppt "COMITÉ INTERSECRETARIAL SOBRE CAMBIO CLIMÁTICO Sustainable Energy Roundtable: Next Steps Post-Kyoto: Options for the U.S. Relationship to an International." Climate Change: Frameworks for Policy and Action Chris Beauman 19 January 2006. Comparing CO2-Emsissions of European Countries. 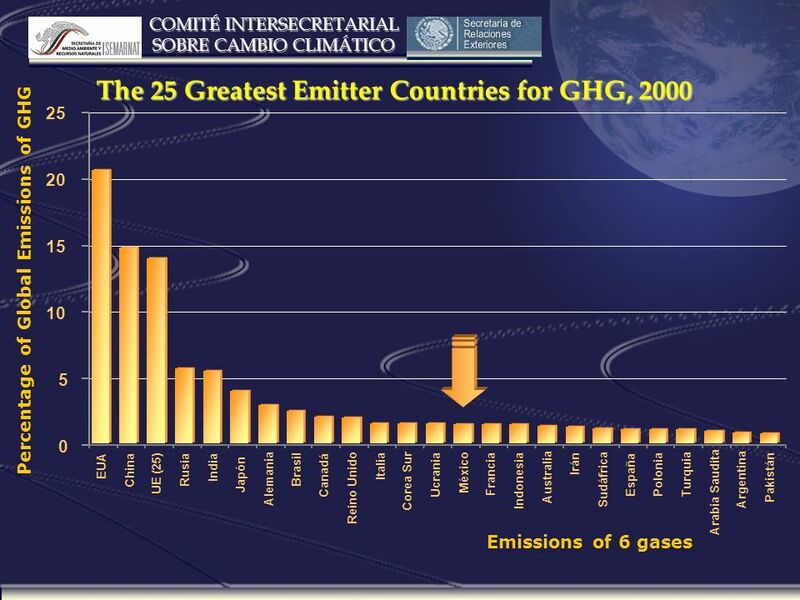 General -Impact on Environment -Global CO2-Emissions -Kyoto-Protocol -Climate Index Sweden Germany Switzerland. Emissions Inventory: India & China Assessments P.R. Shukla. A Corporate Perspective on Climate Change Tom Jacob DuPont Climate Change and Business Opportunities Mexico City 18 October 1999. WRI Climate Change: A Perspective from the USA National Climate Conference, BASIC Side Event Gallagher Estate, Johannesburg, South Africa October, 2005. Technology Transfer in the CDM DUAN Maosheng Tsinghua University Linking Climate Mitigation Policy and Modeling in China Workshop February 18, 2006 Beijing. Framework conditions for action: A Business perspective European Commission stakeholder conference: Post climate policy for the EU, Brussels, 22. ECCP II Stakeholder meeting Oct 2005 Slide n° 1 The European Climate Change Programme ECCP II The European Climate Change Programme ECCP II Angel Perez. The GKI Telephone: /2 Website: What is Carbon Finance? UKRAINE: JI PROJECTS IMPLEMENTATION Svitlana Nigorodova Ministry of Environment of Ukraine.